Traveling to the Bahamas is a cinch! 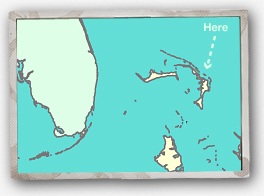 When booking your flight, your destination will be Marsh Harbour, Abaco, Bahamas. Once in Marsh Harbour, the customs process is quick and easy. Step right out of the airport, and hail a taxi. You will need the taxi to take you to the dock for the ferry headed to Guana Cay. Please Bring Cash! Note: They WILL take American money. Taxis do not take credit cards and the drive to the ferry will run you about $12. Once in Guana, we can make arrangements to pick you up from the dock and take you to your hotel.